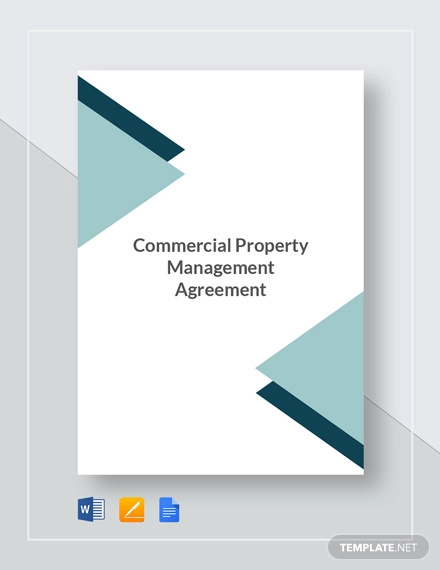 Organizations and companies both face the growing pressure when engaging with the public and private sectors to reduce costs and improve over all work efficiency. 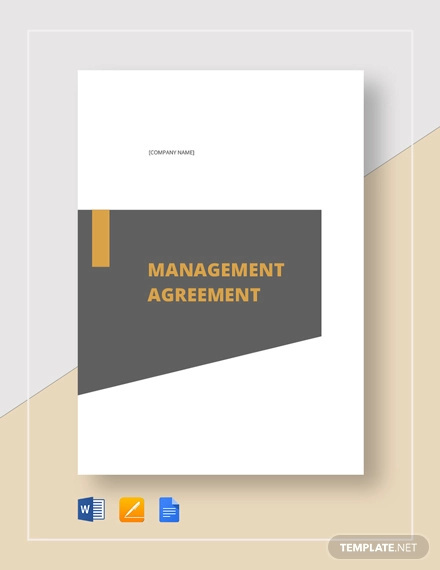 To cope with this, management agreements, or contract management, have been gaining more and more recognition and importance due to its benefits and effectiveness. 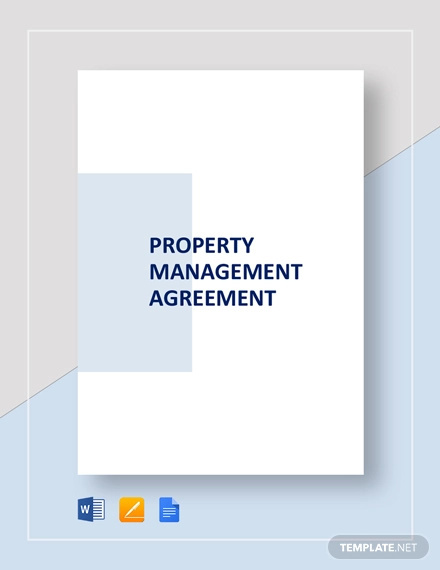 Numerous examples found in the page contain differing types of management agreements from personal to business, commercial, residential, and service management. 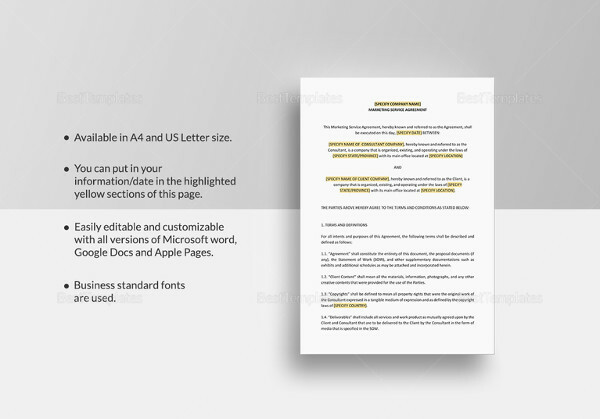 All of the samples in the page are available for download. 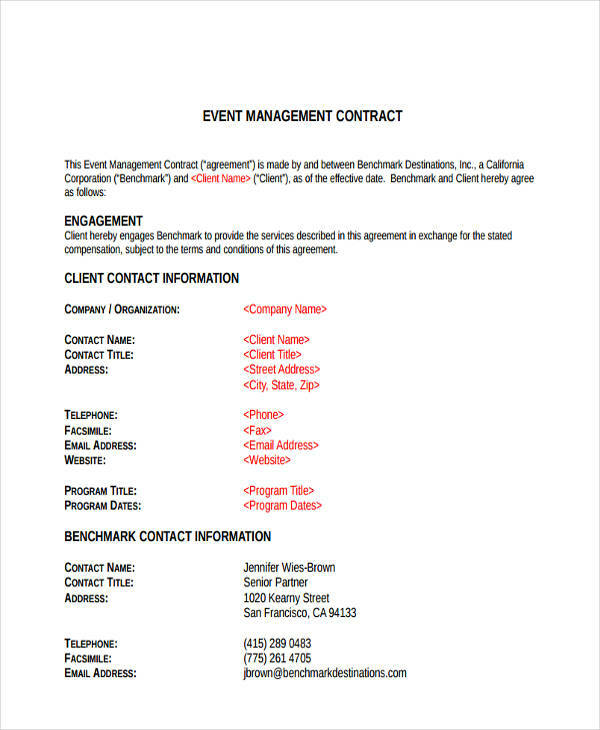 Simply click on the material of your choice in order to access the sample file. 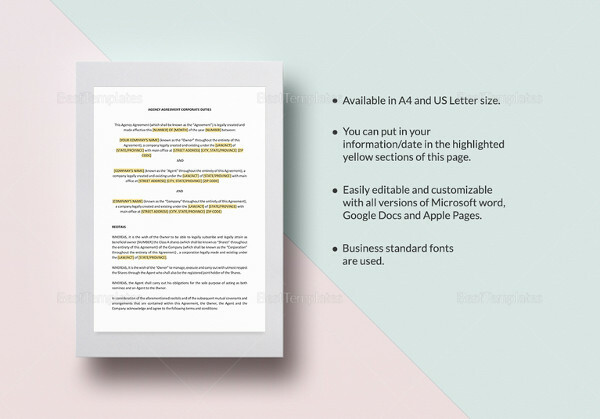 Have a look around as you may find the exact resource you are looking for. 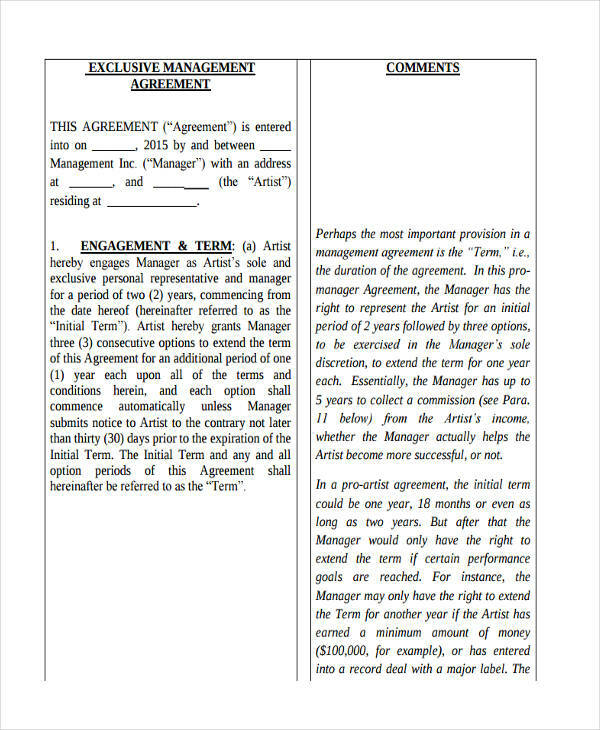 What is a Management Contract or Agreement? 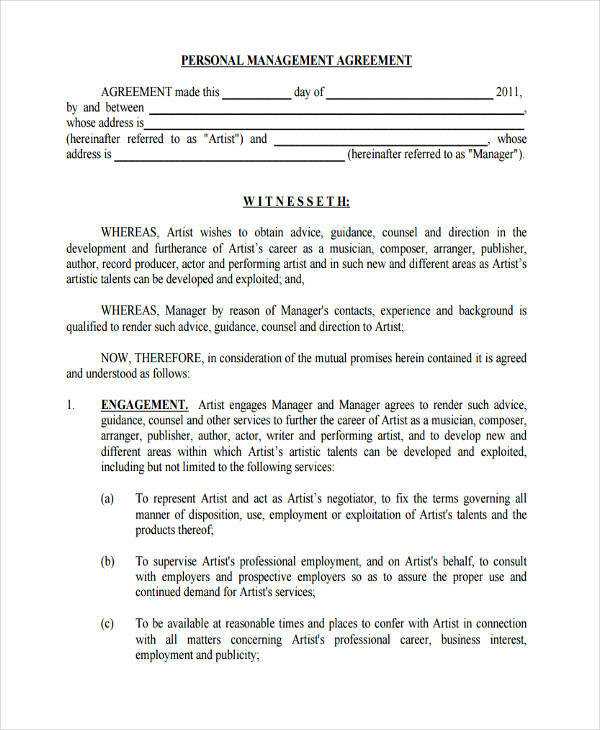 By definition, a management contract exists between a business or enterprise and a separate entity that performs various managerial functions namely but not limited to management of operations of a facility, its personnel, accounting, marketing, and training. 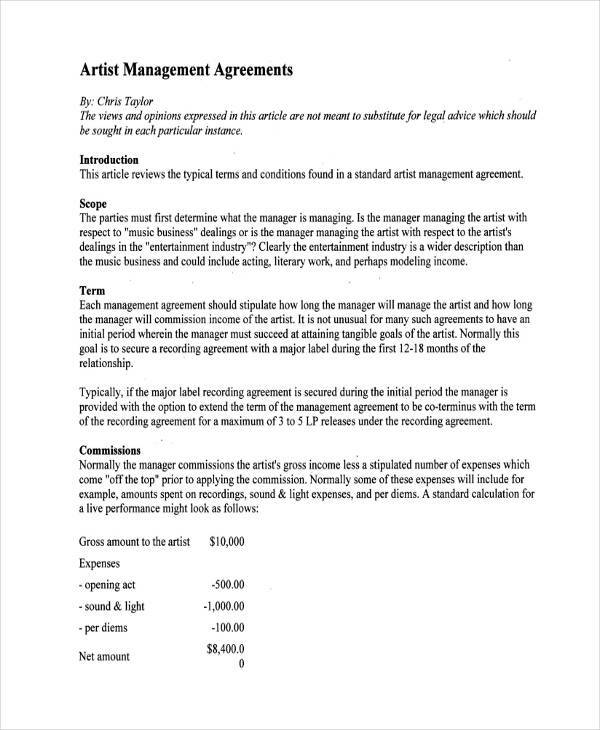 The first recorded management contract was that of Qantas and Duncan Upton. 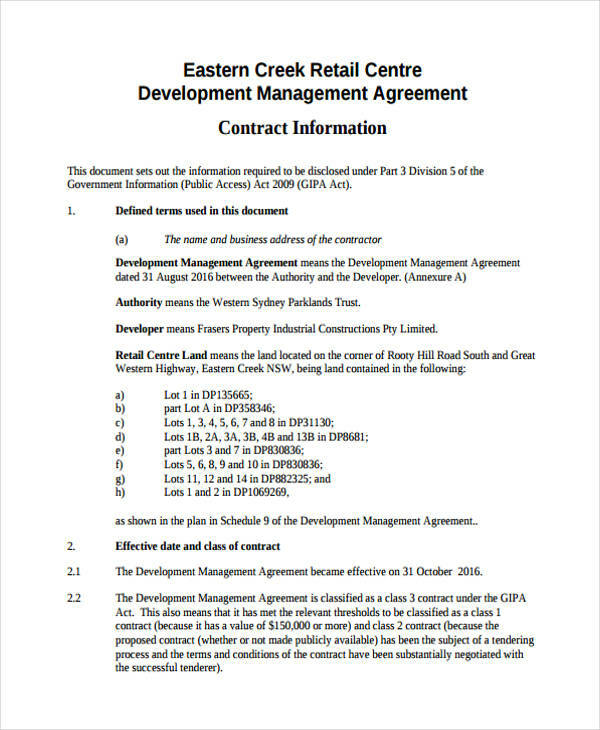 Management contracts are particularly viable for foreign companies wanting to operate in a local environment where the direct cost of doing business, including all employees, would provide more costs as compared to having control only in governing tasks and leaving the smaller and more specific tasks to local employment. 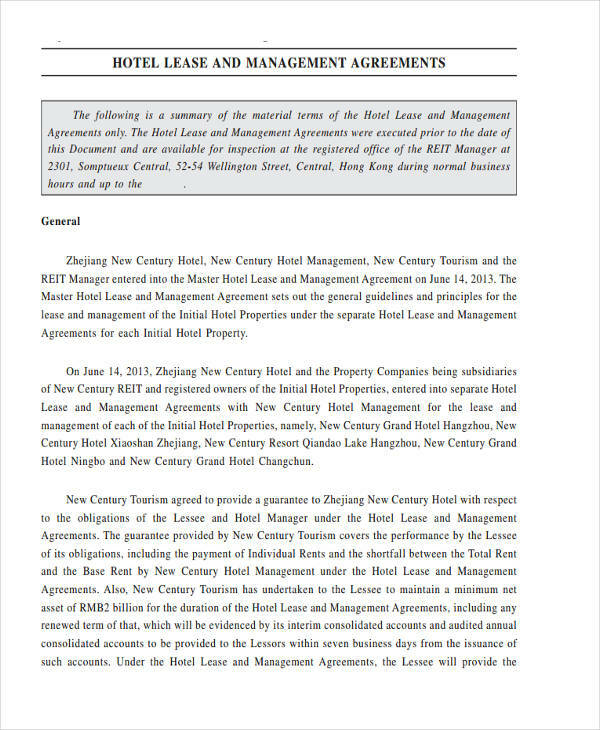 This is also favorable otherwise, as a local business or enterprise would get quality management over the business through the management contract. 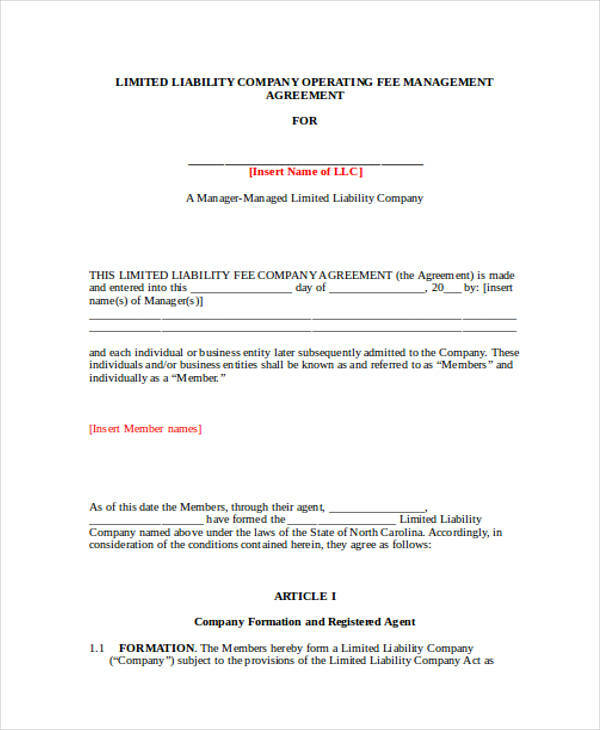 As the name implies, it involves the the supply of raw materials, equipment, power, and labor to a business or company. 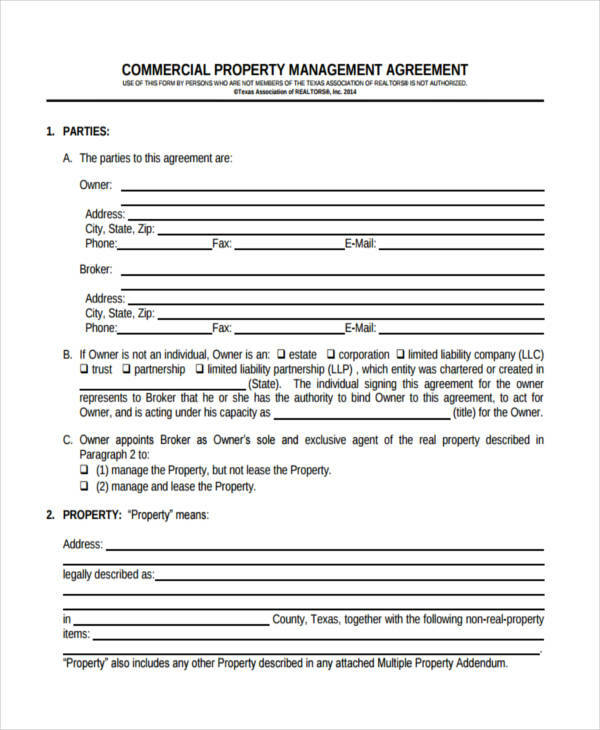 This is for most parts and purposes delegated to common tasks involving non-core business activities like cleaning, medical, catering, security, and transport services. 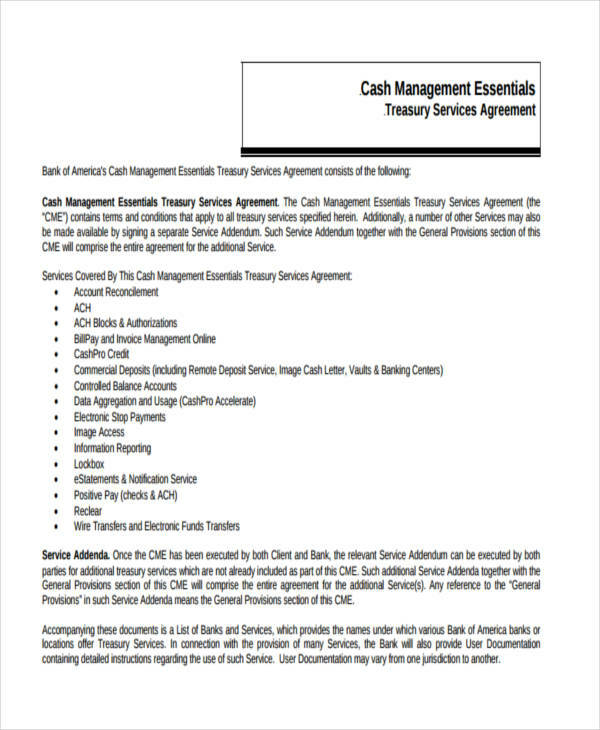 Often popularly called outsourcing, it aims to ensure the supply of the applicable service to be at the standard quantity and quality that the company wants at all times. 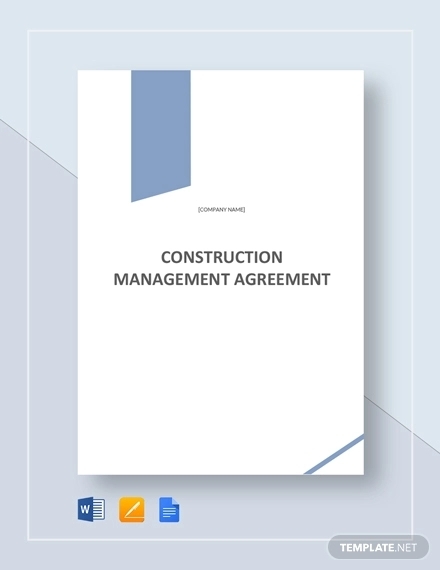 Examples shown in the page include Construction Services Management, Hospital Services Management, Exclusive Rental Management Services, Proposed Construction Management, Real Estate Development Management, Project and Business Consulting Management Agreements. 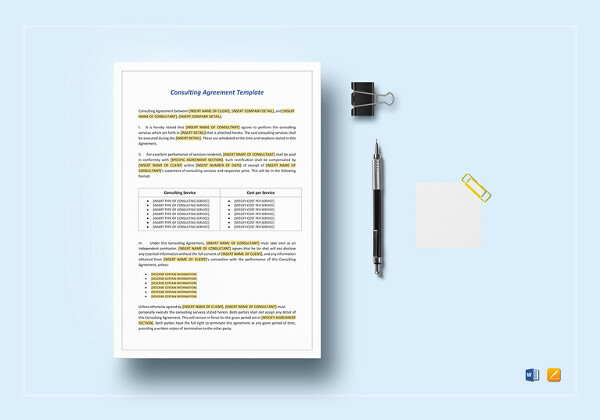 Business process outsourcing is classified under this type of management agreement as it aims to save on costs by delegating internal processes and applications for example to an offshore company. 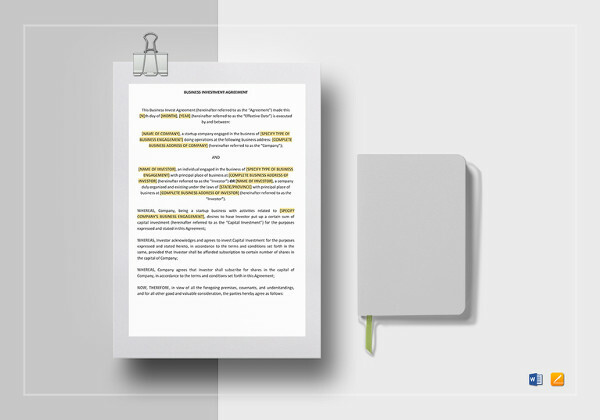 Offshore outsourcing in the form of management agreements between the business and representatives offering foreign labor are categorized here as well. 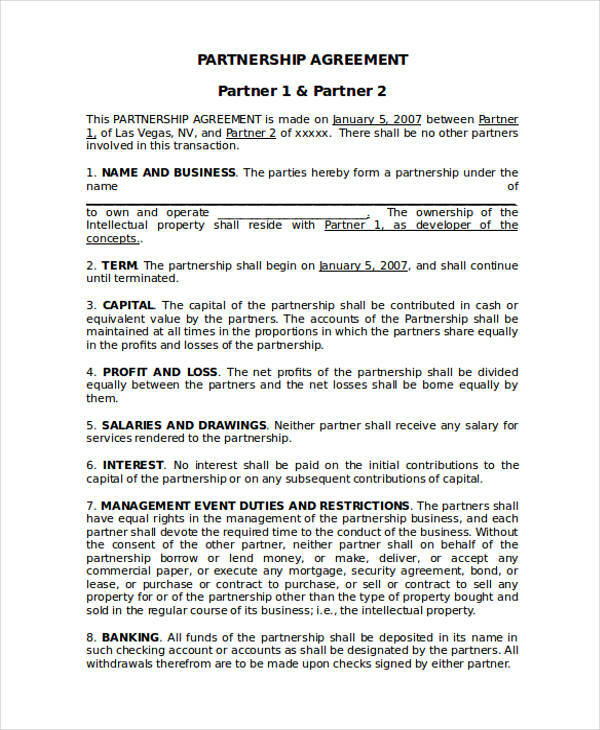 Presently, some companies are offering this agreement more and more to domestic markets. 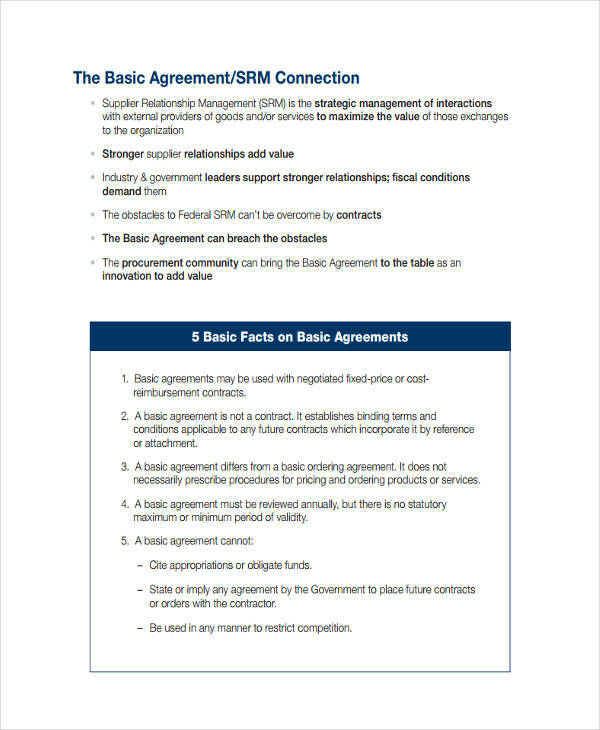 In most cases, offshore outsourcing happens between developed countries to other countries having lower labor costs. 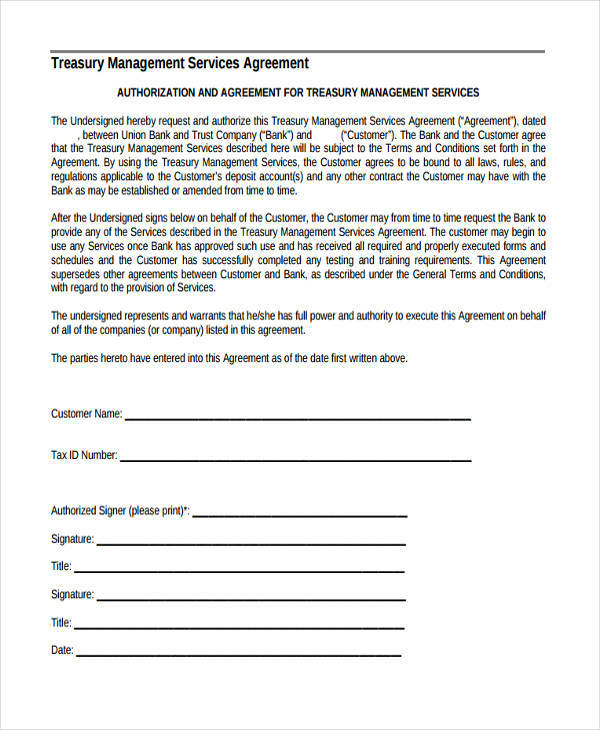 This not only is logical as savings can be generated due to the lower labor rates, it also frees up key people in the organization to be assigned tasks that would generate more productivity in accordance with that individual’s capacity for work. 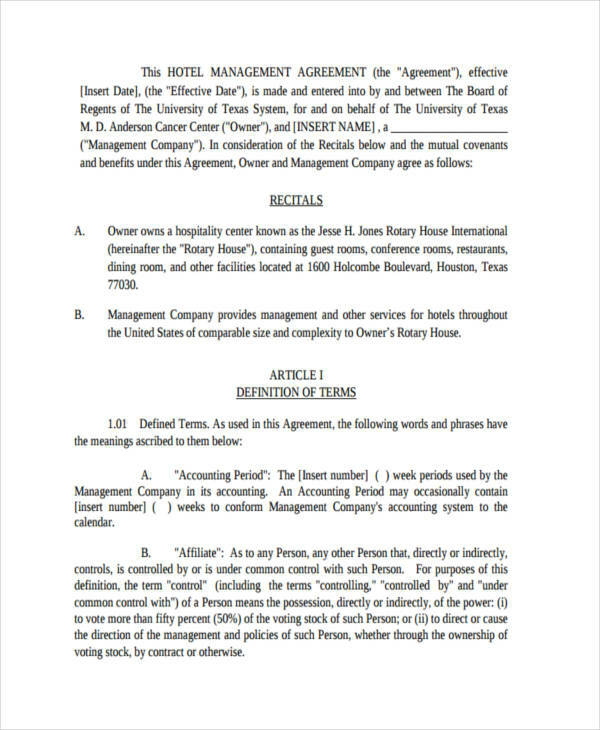 The emergence of outsourcing has not only changed the way businesses work but revolutionized the way all of us do business and made the world smaller through the connections being made. 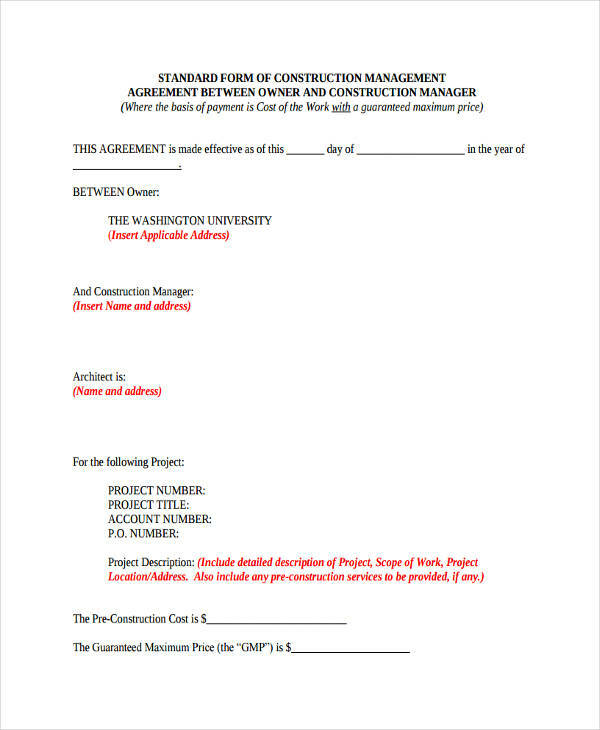 Cost plus percentage of cost contract – contractor is paid for all incurred costs in the project plus a percentage of these costs. 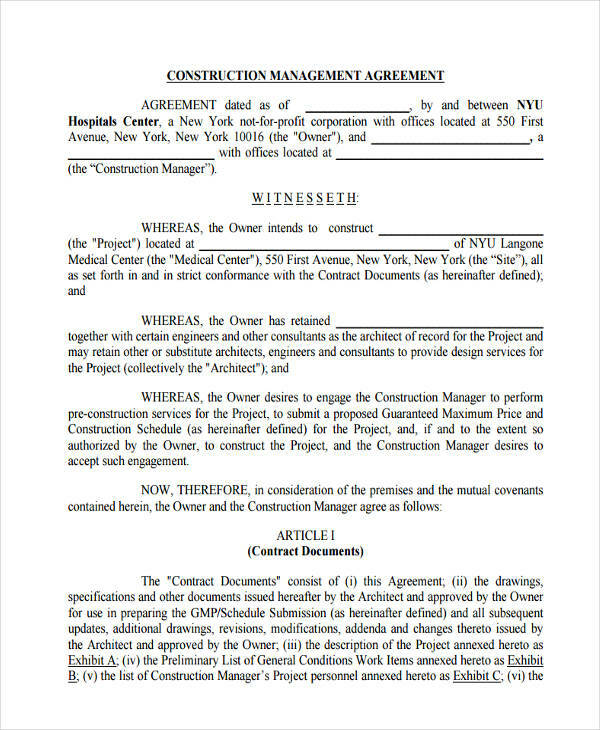 Time and materials – A combination of Fixed Price and Cost Reimbursable Contract. 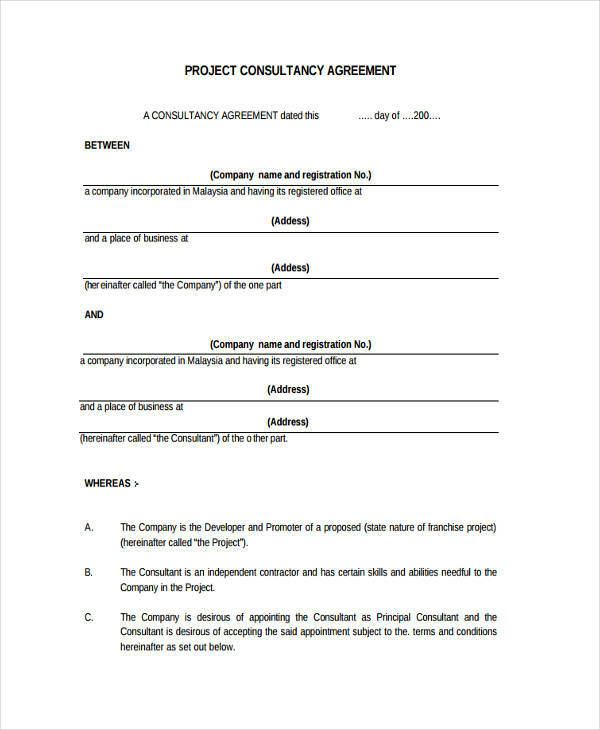 While fixed price contracts are disadvantageous to the contractor and cost reimbursable contract is the opposite, risks involved for the first two categories of the procurement contract are divided here between the two parties involved in the contract. 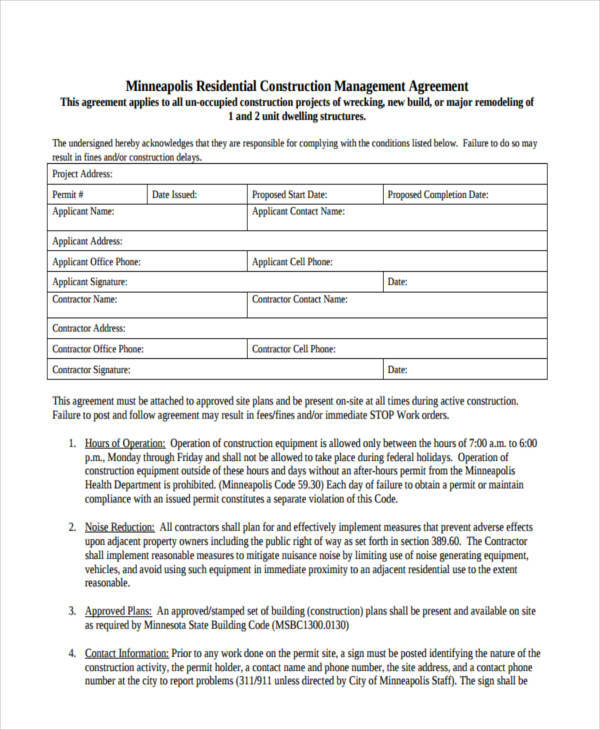 This type of contract is generally used when the required supply are labor hours. 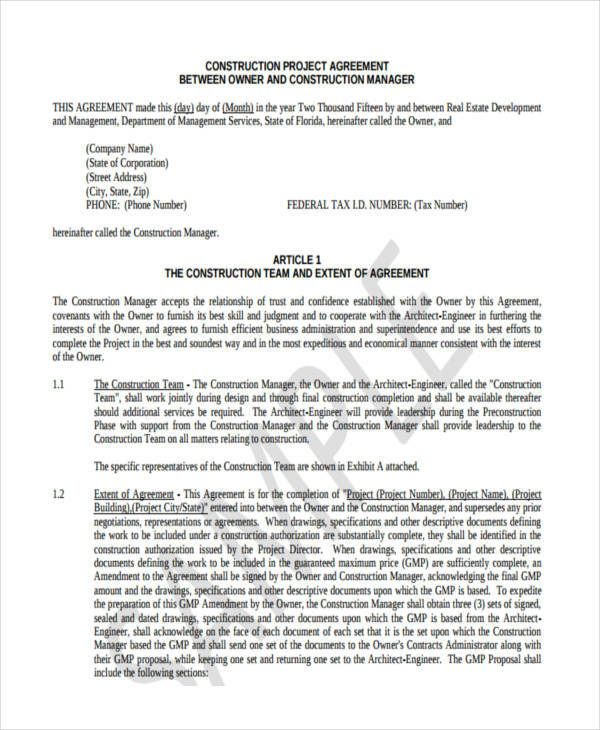 This type of contract involves the company providing the required qualification and or experience to the contractor with the contractor supplying the staff. 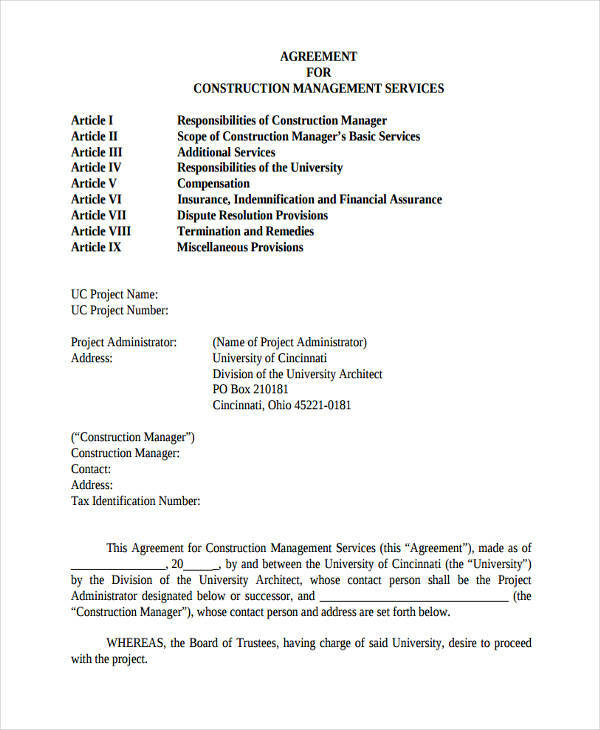 Selection of the type of procurement contract is definitely important as it may be the fine line between the success or the failure of a project. 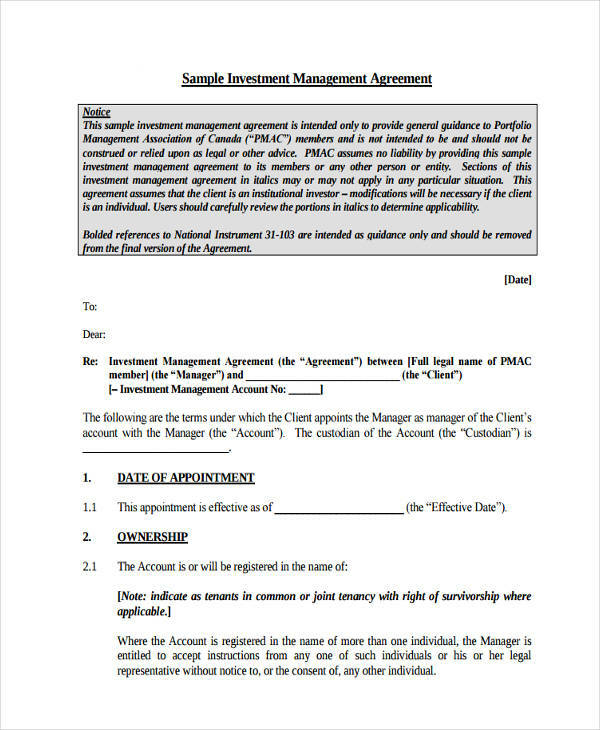 As you browse through this page, examples are there to guide you through to your decision in formulating or making the proper agreement that would suit and work well for your company or business. 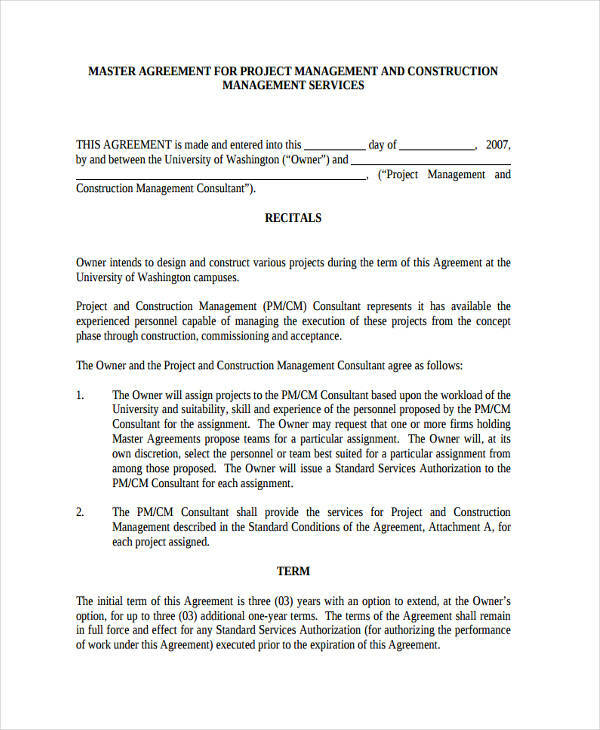 Maintenance Management Contract. 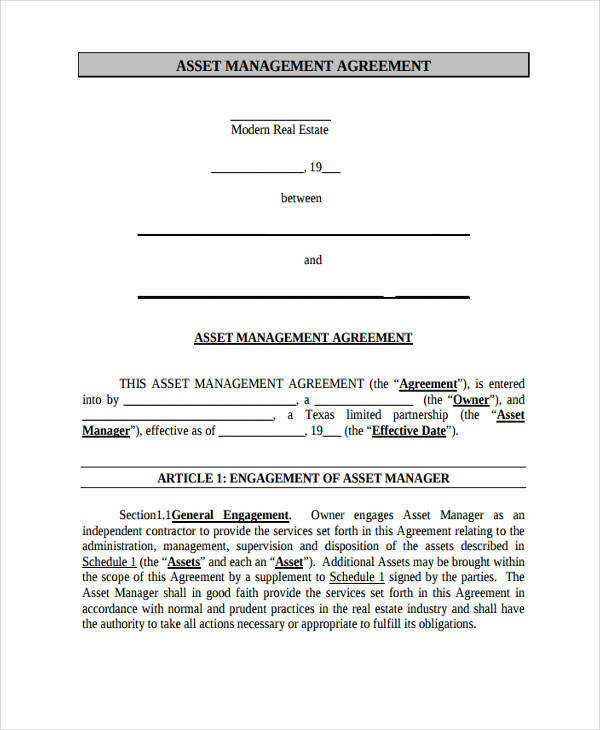 The arrangement or agreement that exist between a company or enterprise to engage in the regular maintenance of equipment or assets of a company. 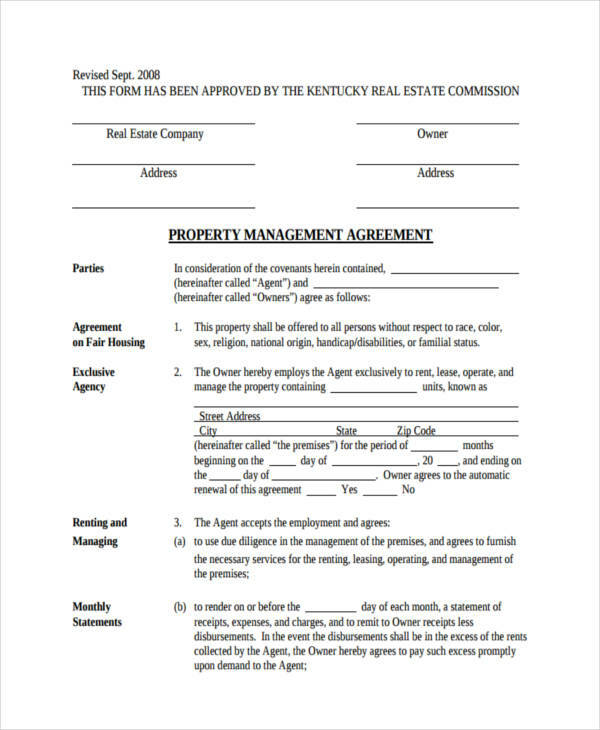 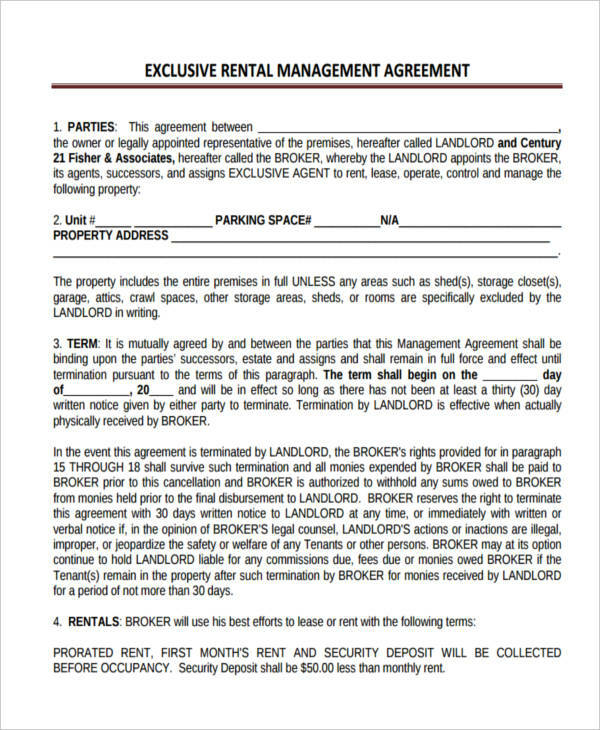 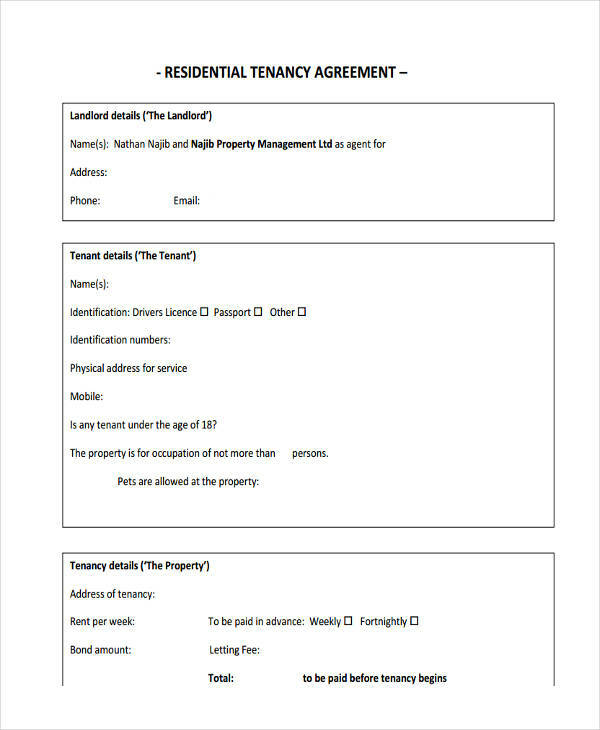 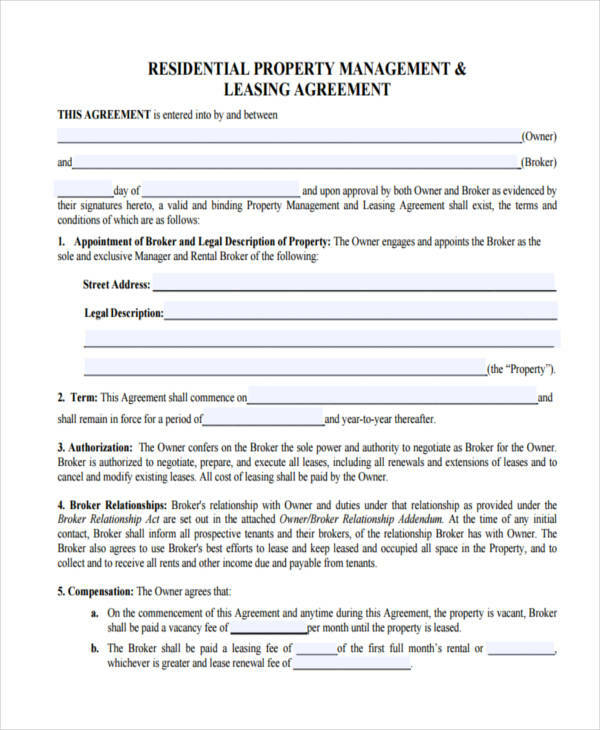 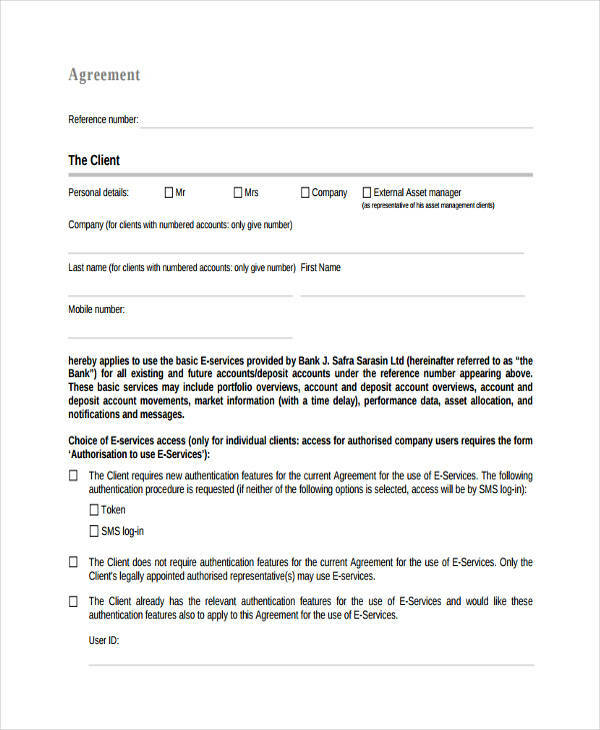 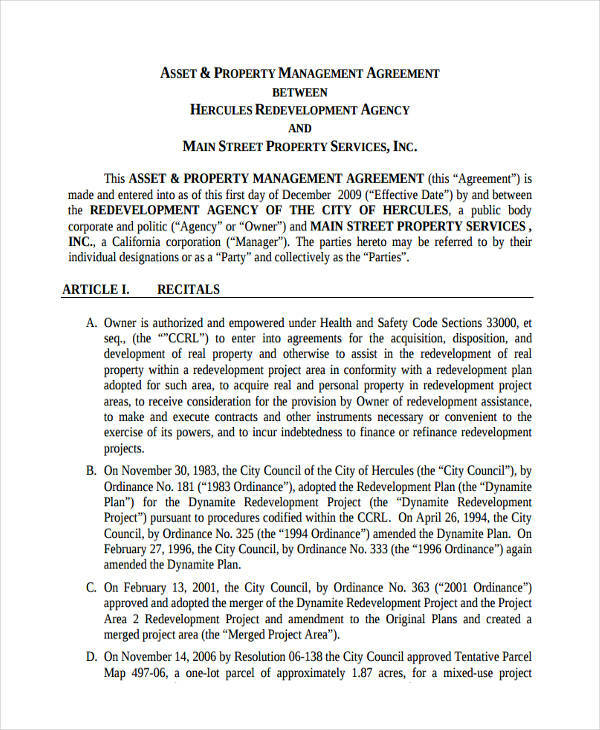 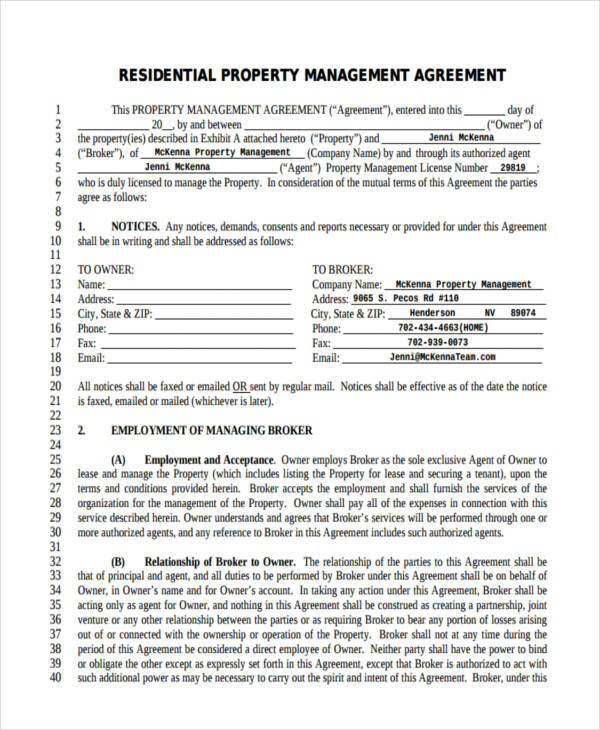 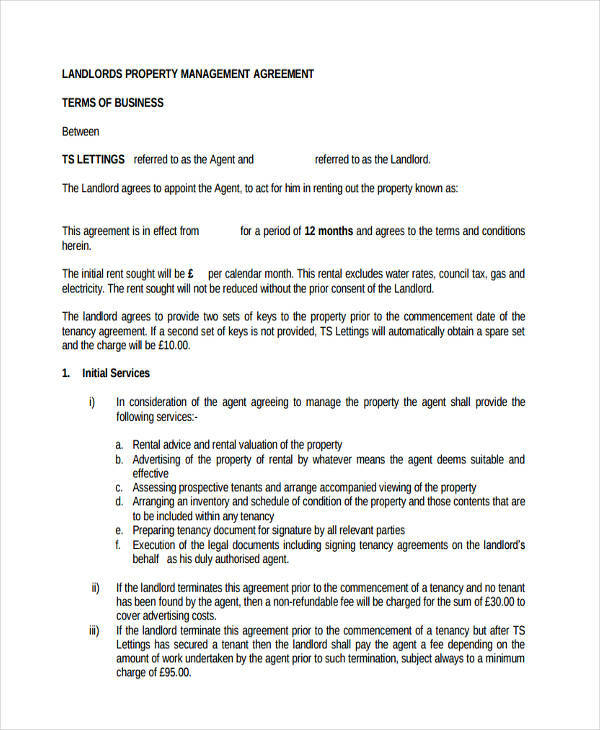 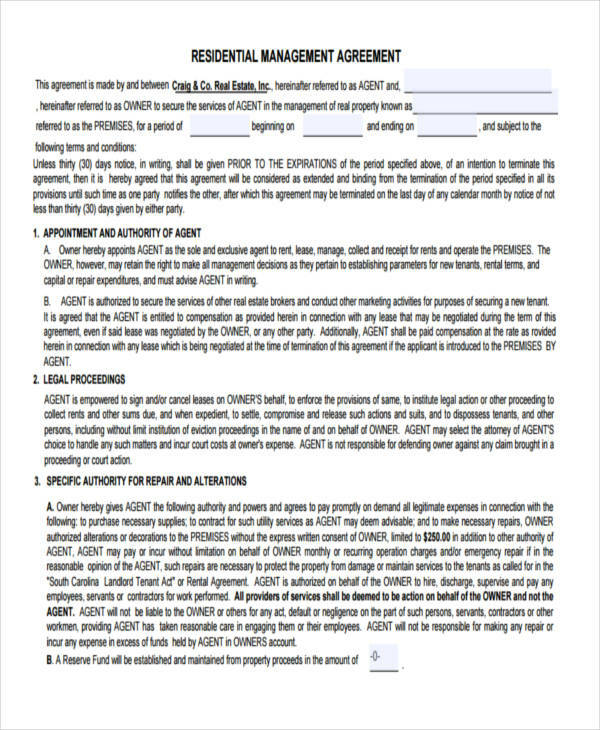 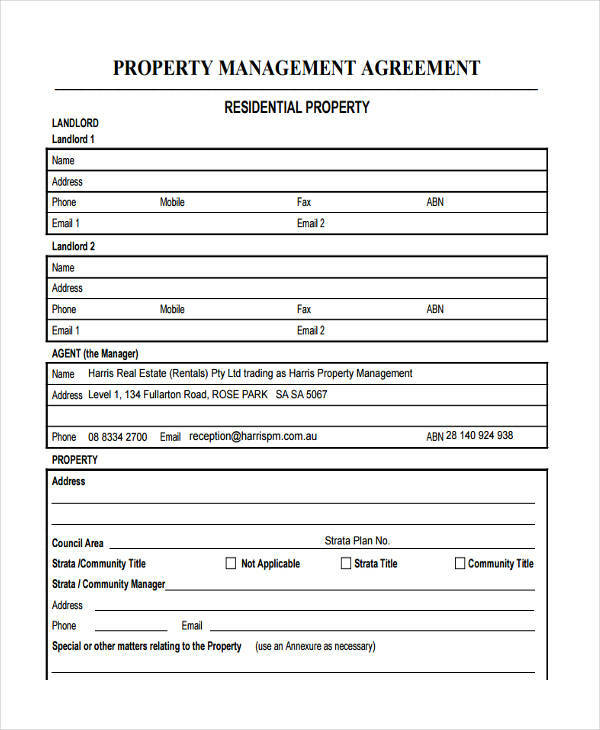 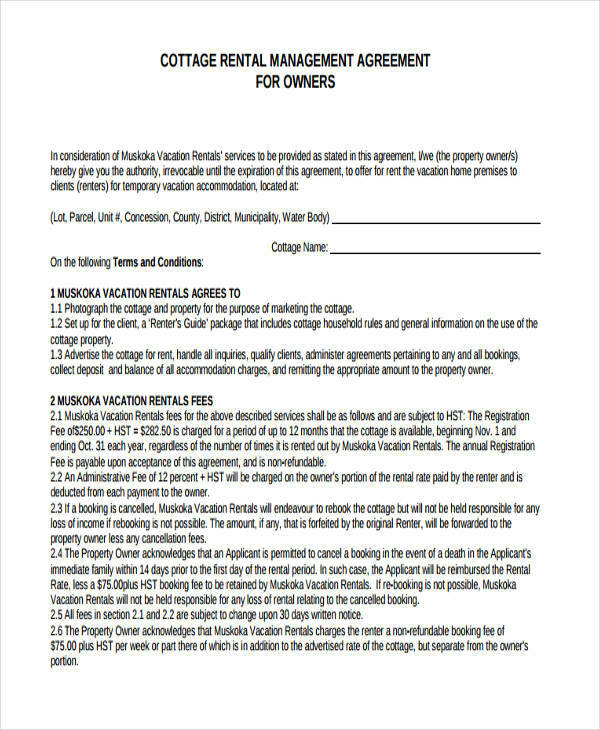 At times, these agreements or contracts exist from the vendor supplying the equipment itself as part of or an extension to a contract or agreement to supply the equipment or asset to the company.Examples of such an agreement found in this page are Residential Property Management, Asset Property Management, Hotel Asset Property Management, External Asset Management, and Commercial Property Management Agreements. 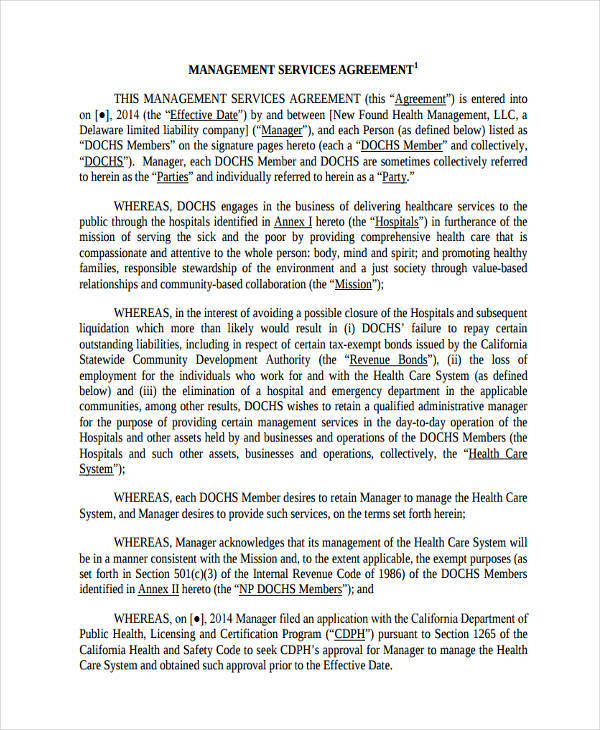 Some examples for operational management agreements can be classified as both maintenance and operational management agreements. 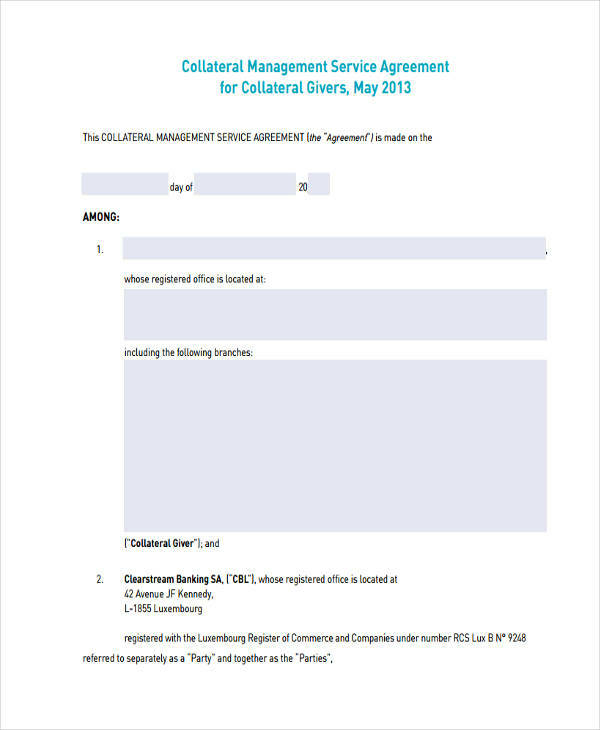 Clauses exist that appropriate for the maintenance and operation of equipment in a business or company. 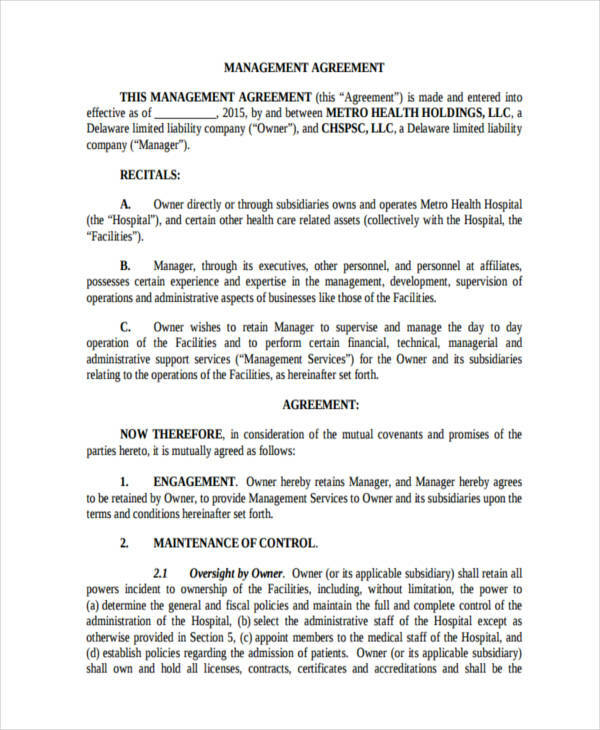 However, the difference lies in the maintenance of that asset alone and the actual handling of operations of that business. 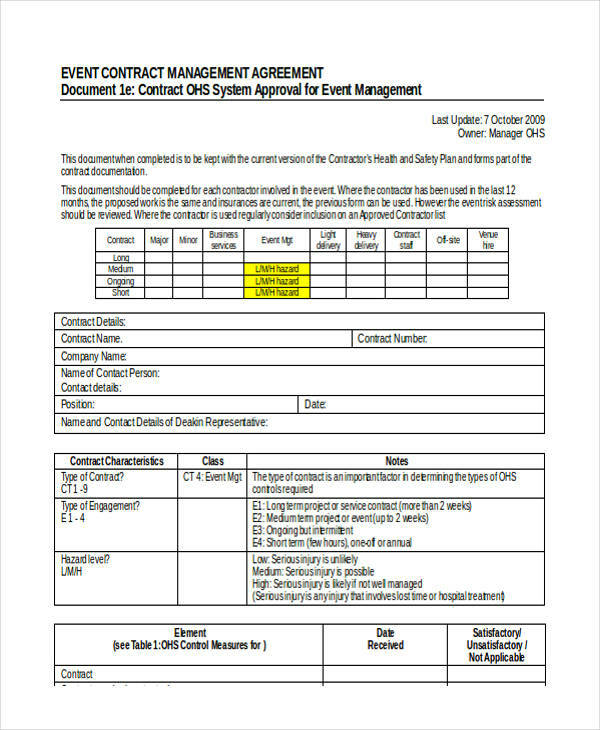 Operational Management Contract. 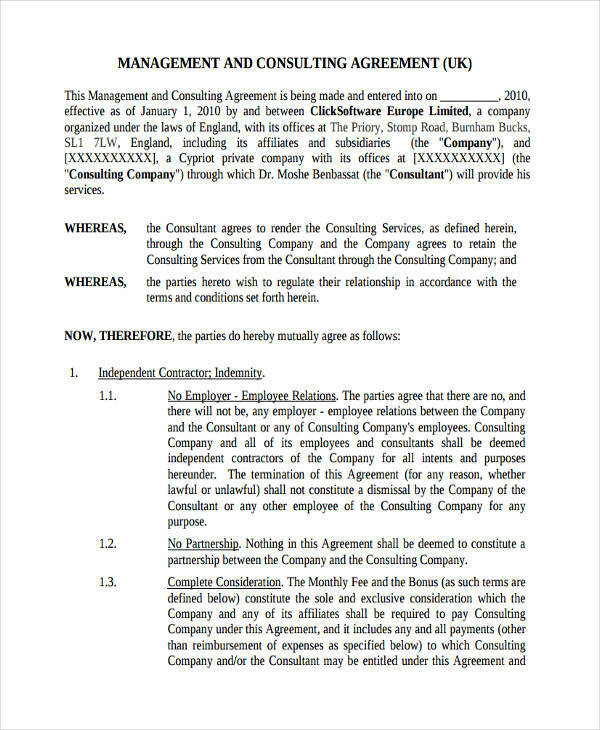 These are agreements that involve administering or governing operations of a business or enterprise. 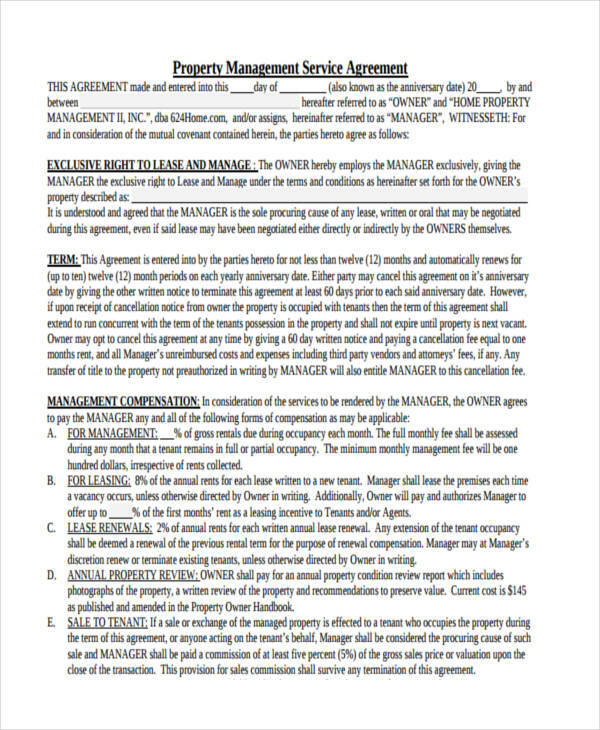 These agreements often occur for businesses operating for the first time or they simply cannot find local manpower to direct the operation of a business. 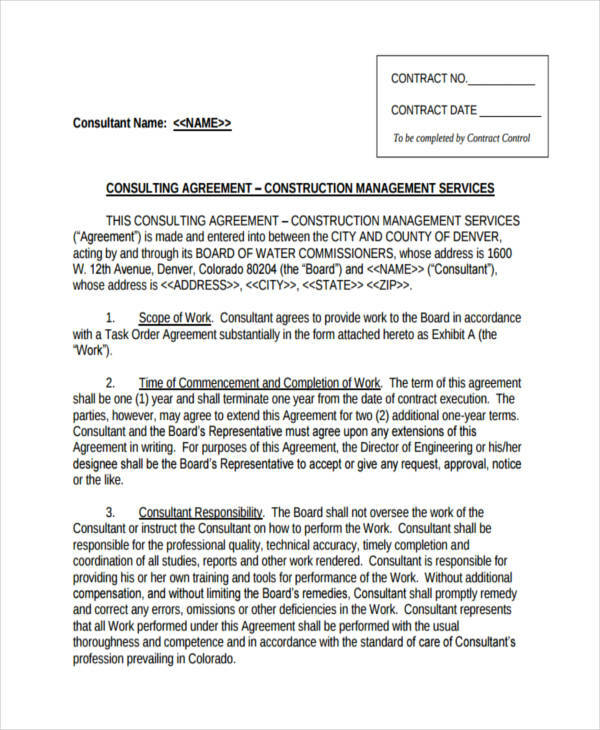 They hire experts in the field to govern operations and ensure the proper standards being followed by employees.This type of management contracts often exist between major transport facilities or enterprise like airports, sea ports, and stations. 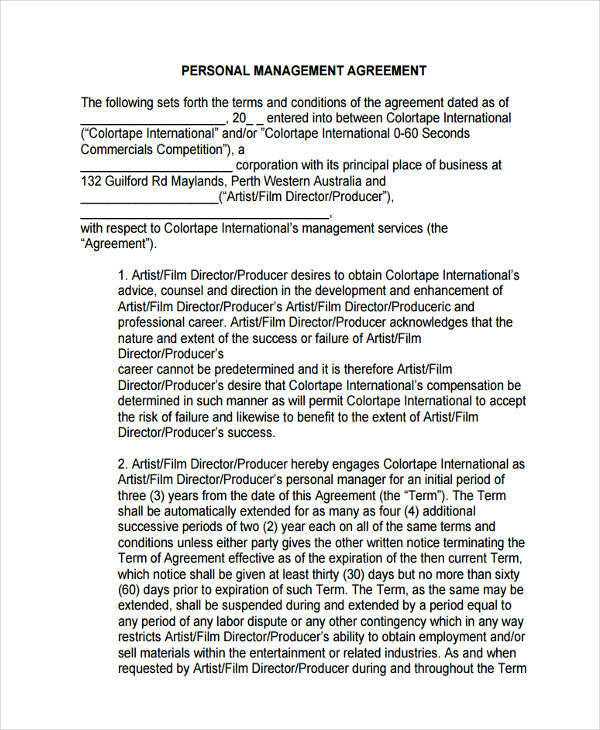 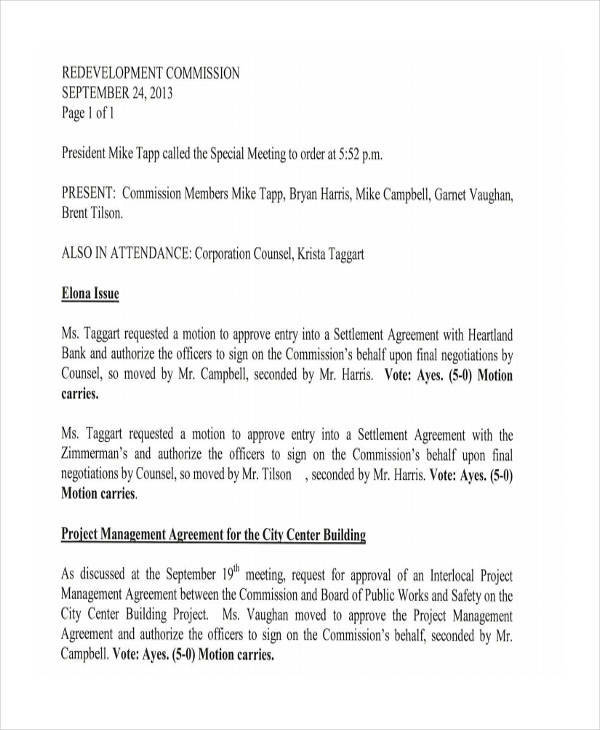 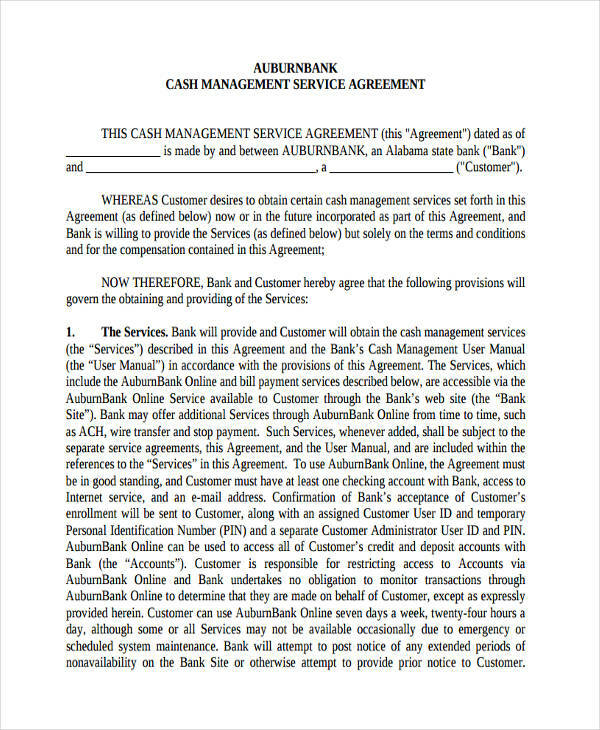 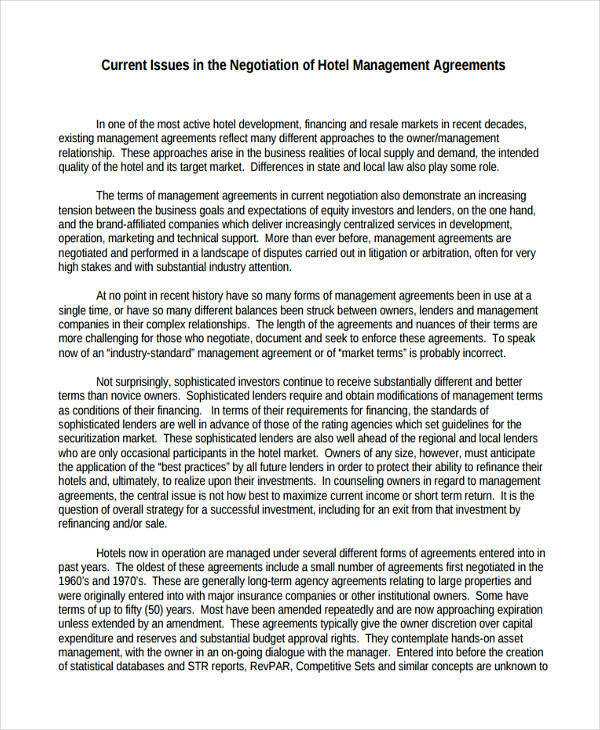 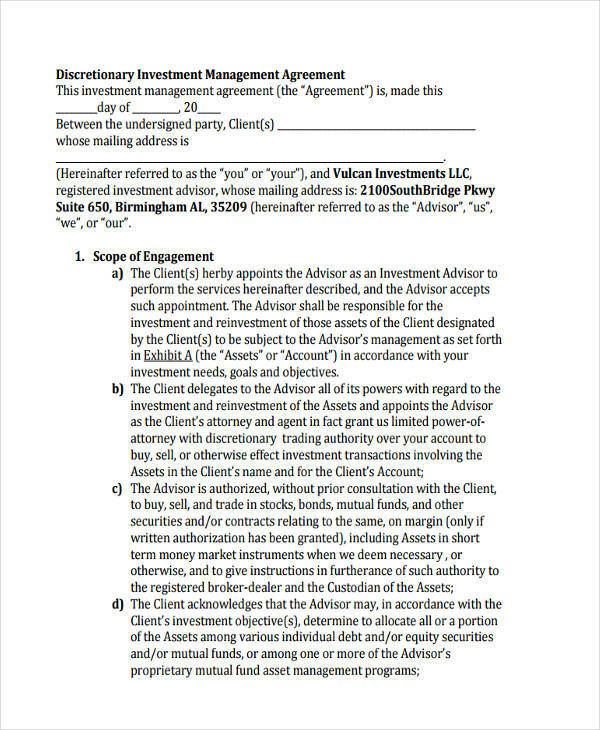 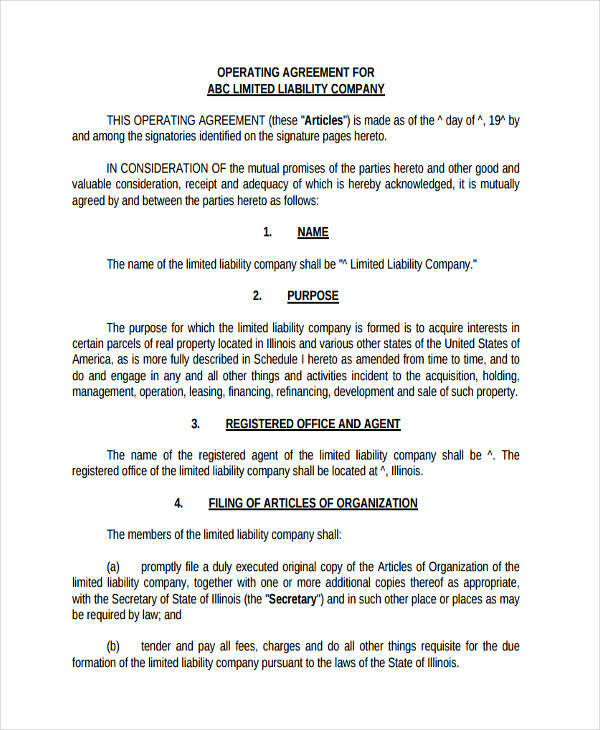 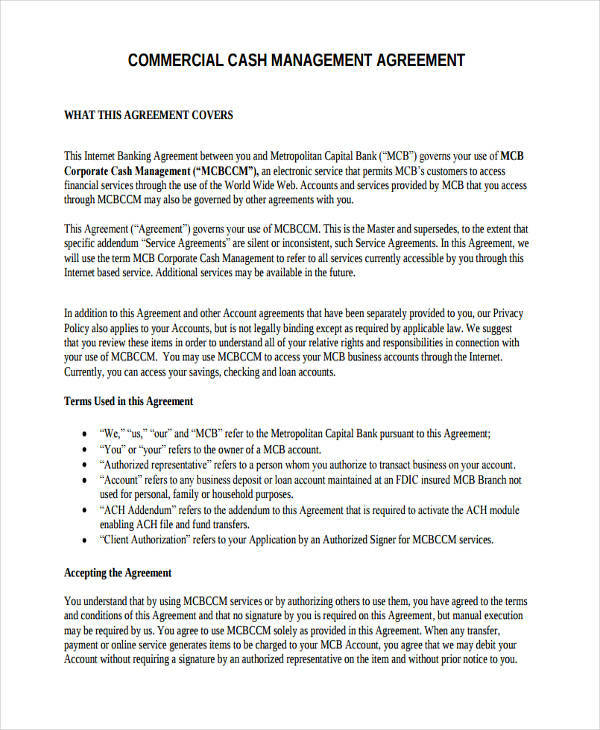 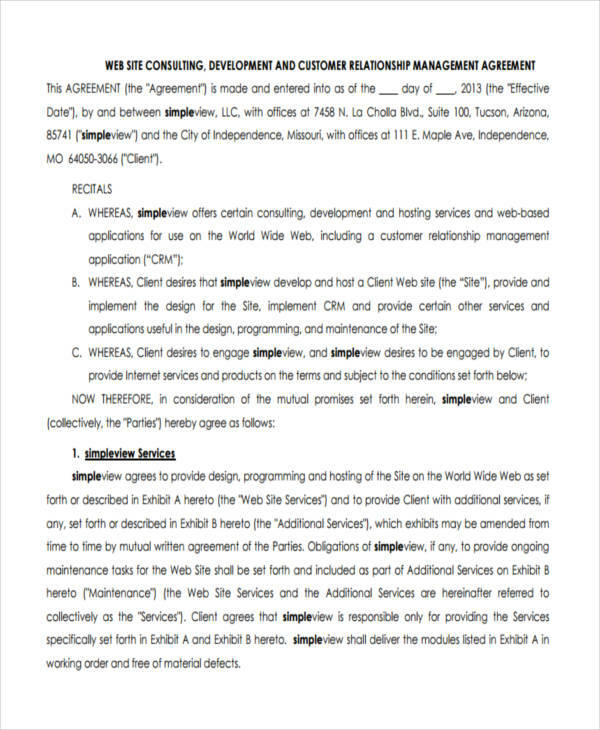 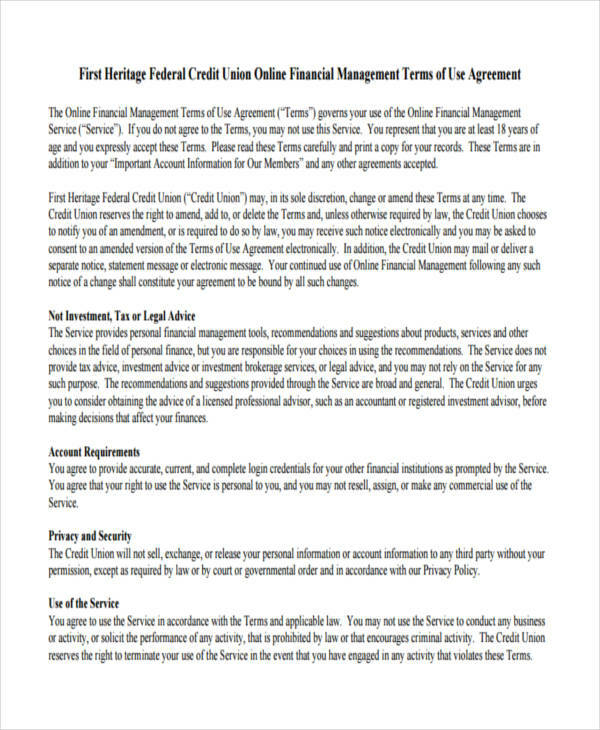 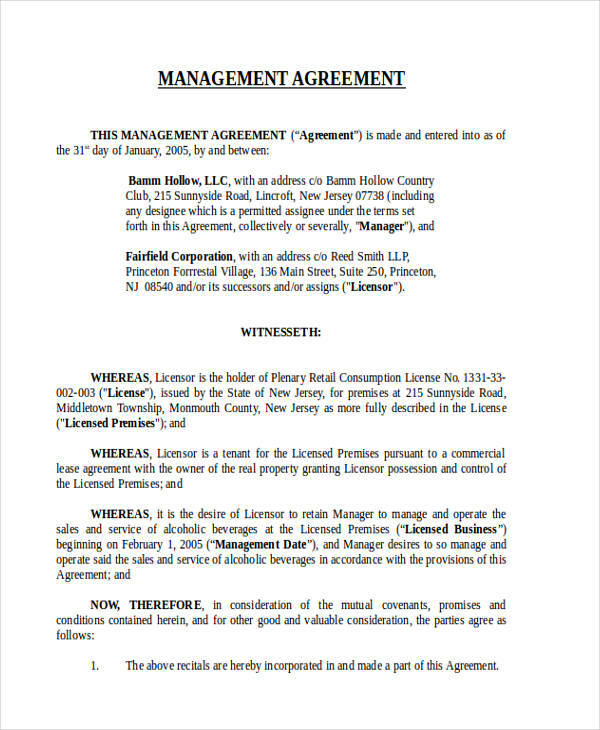 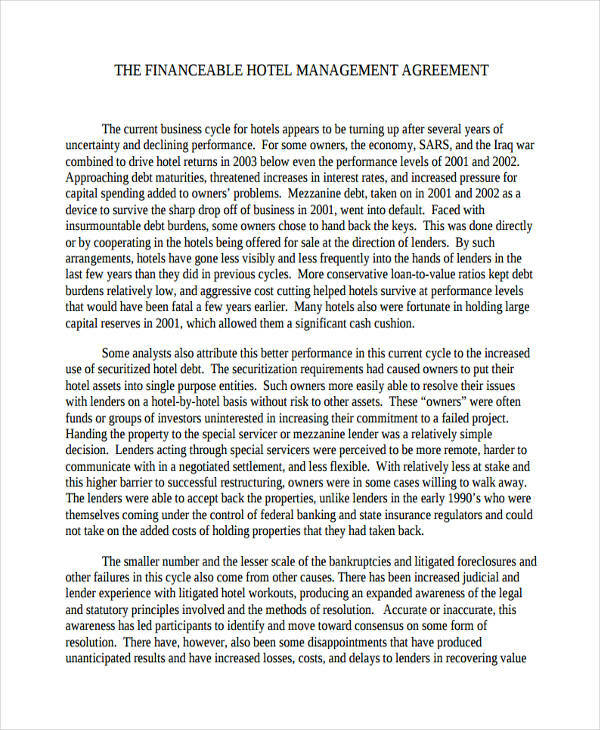 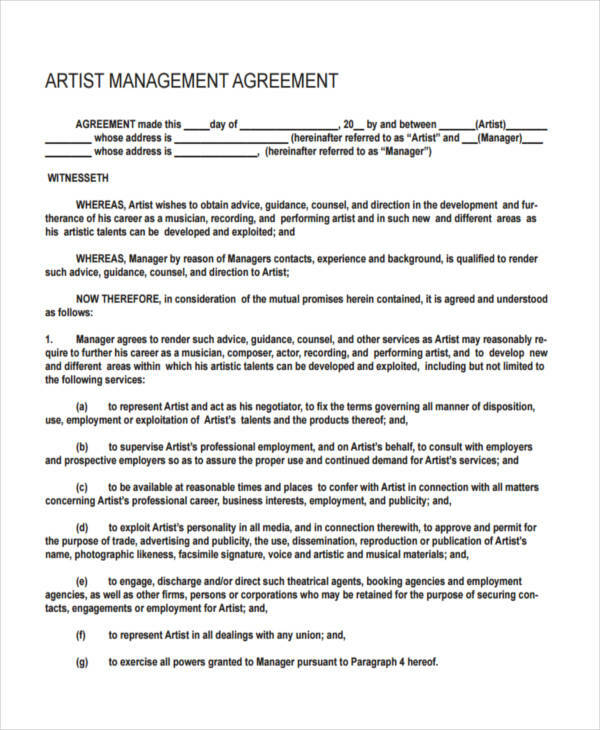 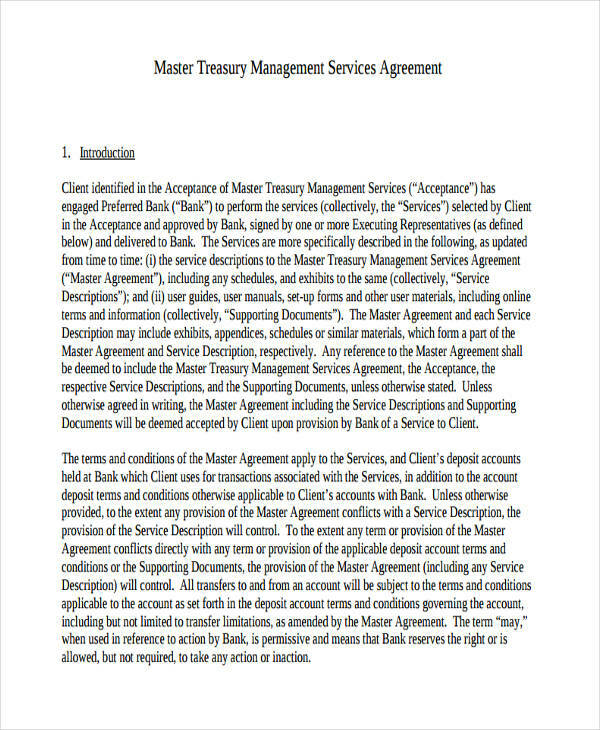 These agreements are also common with hotels and casinos.Examples of this type of management agreement found in this page are Simple Hotel Management, Retail and Small Business Management, Exclusive Residential Rental Management, Personal Financial Management, Operating Property Management, Fee Management Operating Agreement , Customer Relationship Management, and Supplier Relationship Management Agreements. 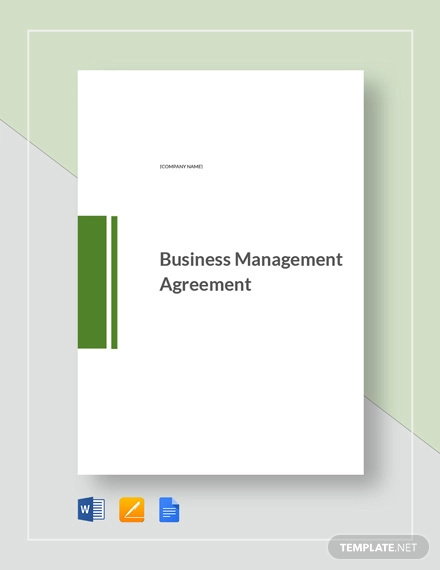 Different types of management agreements exist to address issues in a business having limited resources or cash flow. 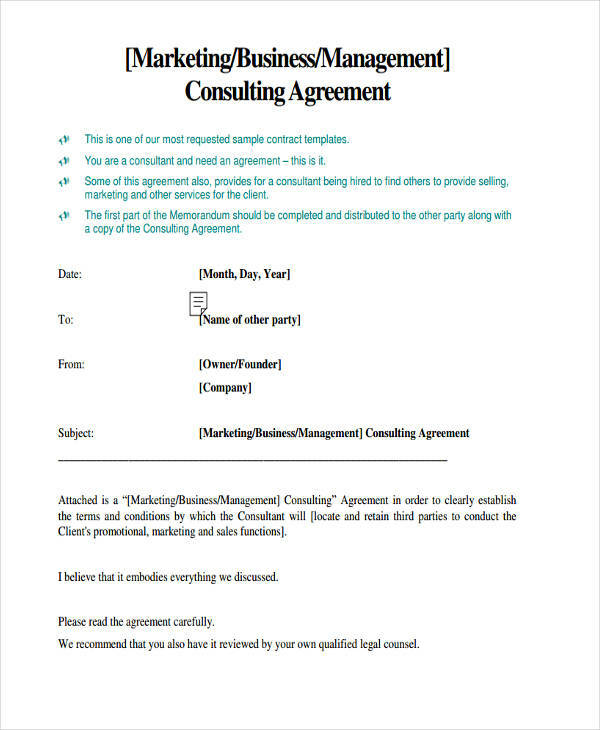 It is simply logical to save up by limiting internal activities which would only cost more than by simply outsourcing it to another company for a smaller price.